he reviewed by our magazine in January of this year, power cable Demiurg shocked us with its price, quality of make&finish and it didn't leave us indifferent to its sound. It was, if I remember correctly, the first Polish product associated with power supply, of that quality, performance and price level. Until now the leader in this area was the Reference Power Distributor by KBL Sound, followed Base Power Base High End power distributor. Since then much has changed, and during this year's Audio Video Show (2016) we could see and listen to power distributors, conditioners, and so on, that looked equally good and were similarly priced. Almost 23 000 PLN, as that's the asking price for the latest product of the company with their headquarters in Dąbrowa Górnicza, is not that much of surprise as it would have been a year ago. Pricing of this high-end product will allow manufacturer to sell with profit not only in Poland but also anywhere in the world. 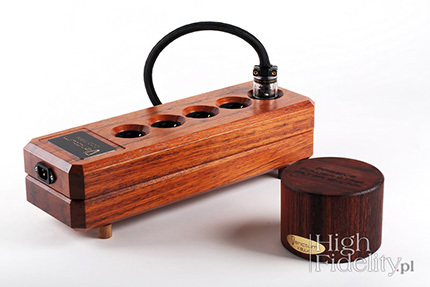 For the money one buys a beautifully made power distributor. In contrast to all competition, the strip was made of wood. Also, its feet legs are wooden. Other successful brand that followed similar path is the Swedish company Entreq. As the gentlemen of Verictum wrote, the distributor was "tuned" for standard operating conditions, ie. to be placed on the floor, wooden shelves and carpet. And then: "But of course, each user can customize a base for his own preferences, as the strip is receptive subject to a skillful tuning of tonal balance, etc." It is equipped with the five top of the line Furutech sockets with gold-plated contacts and IEC socket from the same brand. It is large and makes a very good impression. Soon company will introduce a version with dedicated tap to the passive X Bulk conditioner and this special set will be available for the price of 26 000 PLN. The version we received for this test was the one without this tap, but with the latest version of X Roll with a plug adapter - so were able to check how the Cogitari works with it. According to manufacturer the "X Bulk from the moment it is connected to the power distributor needs a few hours charge before it reaches its full potential." 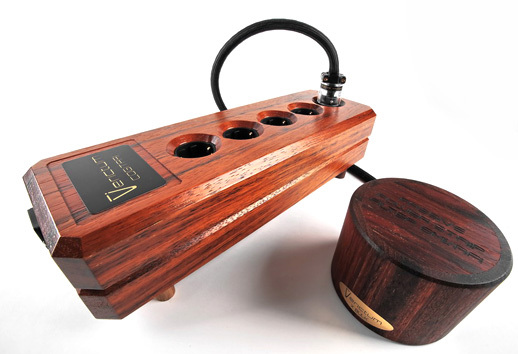 Our aim was to build a power strip offering not only an excellent sonic performance, but also with a unique appearance. We didn't want our product to belong to the category of those that users have to hide somewhere behind the rack. We wanted it to be something its user could proudly place in the plain sight, while it should, of course, maintain its full functionality. - Without external filter, which current users of X Bulks will probably welcome, because they can go ahead and use it with Cogitari to a very good effect. Cogitari was designed from the scratch in-house using the conductors developed by us and our original solutions for the best sound effect. During the work and tuning process of the distributor we used our power cables, Demiurg, which represent a reference product for us and an excellent matrix that allows us to hear the differentiation, the full spectrum of sound and its volume, even the tiniest nuances of articulation, details and dynamic and tone contrasts without any averaging. Our aim when designing Cogitari was to obtain the highest possible quality and naturalness of music playback, especially when listening to classical repertoire and the music created with the use of acoustic instruments and the human voice. 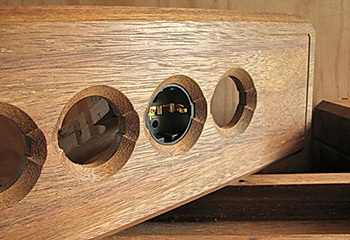 The Furutech sockets, our wiring, special passive filter, the vibration damping enclosure of exotic wood, its support - decoupling from the surface it is placed on by sonically selected and shaped feet of two different kinds of oiled merbau and oak wood, its specifications, such as: weight, shape, enclosure design, the thickness and configuration of the walls, and even the special, selected lacquer, they all combine in a special tuning, voicing similar to that, used when building a bow instrument. As mentioned above, we fine-tuned Cogitari and equipped it with a special filter (that works in a similar way as the Block X) absorbing EMI/RFI noise and converting it into the heat energy. Its purpose is to protect the distributor against interference coming from outside as well as those generated by the strip itself as a result of the current flowing through it. The filter has been permanently encased in the base of the strip and flooded with a special material that is also an important element of anti-vibration filter and the strip itself. 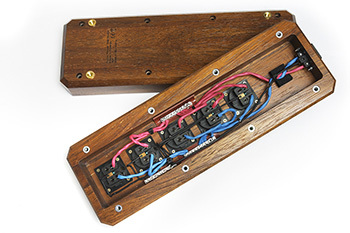 Cogitari wiring features a cryo-treated conductor with 4 N silver plated with 24K gold, metallurgically prepared in the same manner as the conductor of the Demiurg power chord. Wires are directional, so the whole wiring of the strip is oriented according to the direction of the conductors, which is why it is very important to make sure the that the power cable supplying power to strip is correctly (in terms of phase) connected to the wall outlet so that the phase is delivered to the IEC socket in the strip to the side, marked with the letter L.
Wires run to each socket in a star configuration. In our opinion, the best solution for the power strips. An a-typical solution, which we consider to be optimal, it is the same length of the cables distributing current to all individual outlets. Thus you may plug audio components to any outlet since they the length of the cable supplying current is always the same. We consider this to be uncompromising solution. It significantly increases the cost the power distributor, but the priority for us, as always, is consistency of sound and a listening pleasure. We have not forgotten about distribution rails specially developed for our power strips. Rails and fixing screws in the rails are made of copper alloy plated with a thick layer of pure polished silver and then subjected by us to several hours of cry treatment. They represent another very important, well thought-through and verified in a series of listening sessions element of voicing of our distributor. These rail can support a load of 80 A each, far more than foreseen load of the strip, which is 15 A.
Cogitari's enclosure is made entirely of logs of exotic wood called merbau. 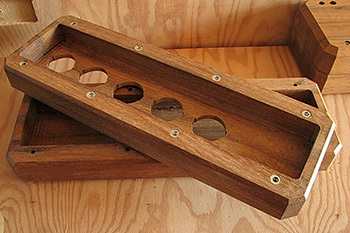 Same as in the case of the Demiurg, housing components are carefully selected and chosen so that the two halves that make up the whole body, are virtually identical in terms of hue and grain, which in the case of merbau wood is not so easy, because even along a single board several shades may occur and not only on the surface but also during processing. The housing is made entirely using CNC machines.